Creative mojo and life force! You’ve got a seed sprouting in your second chakra — maybe it’s a project, a mission, a young’un, a story… and you have the power to give it life. You are ready to “mother” something or someone, to take on the responsibility of carrying a specialness into the world, to nurture it, and others, through the giving of your gifts! Tenderness and patient tending can grow your seeds, as can the understanding that we are all connected, all born from the same Mama Earth. When you understand your connectedness, you realize that sharing your gift isn’t an act of selfishness, but an act of self-nurturing that can ripple out and change the lives of those around you. Go forth, create, and thereby give others the same permission to plant their own seedlings! The Empress stands for creativity, fecundity, life force, abundance, and nurturing. In the modern world the Empress isn’t just a symbol for fertility, but she’s also a businesswoman and creative powerhouse with an empire all her own. She can create great things because she understands the power of collaboration and compassion and can put the quest for resources (financial and otherwise) in proper perspective with the greater heart-centric mission of making the world a better place. 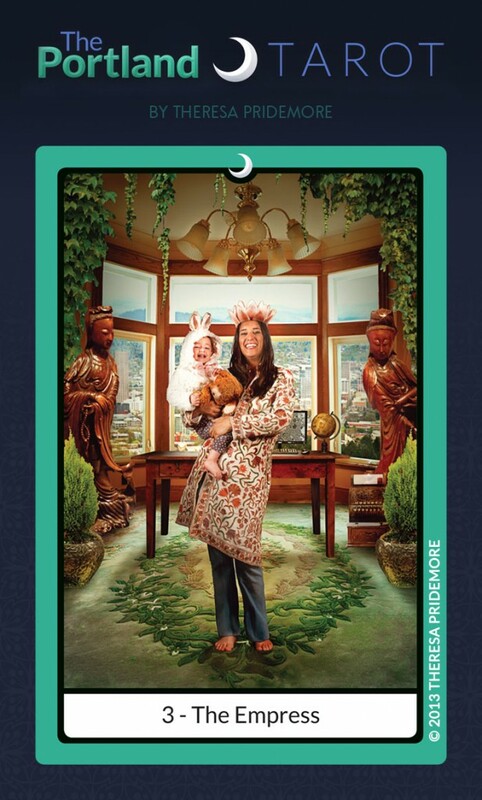 The subject of this card is Portland intuitive counselor and teacher Rev. Liliana Barzola-Read of Lotus Lantern Healing Arts (and her own adorable little bunny rabbit). Liliana and I have been friends for awhile now. At first I was a client of hers, then she was a client of mine (we collaborated on her web site), and after attending her incredible Psychic Kindergarten classes, we steadily became closer and closer as friends. When they say your world can change with one incredible connection, they aren’t lying; meeting Liliana was the tipping point for so much change in my world. Through her teaching I learned how to manage anxiety that I had suffered with for years; she reminded me how to watch my own energy flow, listen to my body, and re-connect with Mama Earth on an energetic level. The information she shared opened the door to me trusting my own intuitive gifts and working with them, instead of taking on the destructive habits I unconsciously learned from my own lineage of intuitive family members. But above that I gained a wonderful, giving friend and a person who showed me the value in reaching out and helping the people in my community. She’s also a creative powerhouse who is totally in love with her work, and she’s always looking for new ways to give her gifts to the world, with the biggest possible reach and the highest integrity. In short, she’s a huge inspiration. If you know anything about Tarot, you probably could understand why I was torn between asking Liliana to be the High Priestess and The Empress. 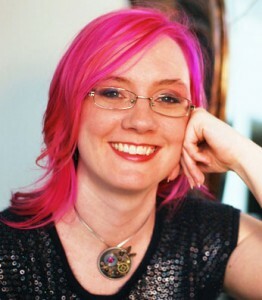 She always had such a strong connection to the divine to me and has a knack for peeling back the curtain and helping others to see into their own deeper knowing. It doesn’t surprise me that I had my vision for the final High Priestess card in a women’s circle that she tended. But part of my thinking in creating the artwork for these cards was also—in some cases—to treat the cards as totems… And Liliana was stepping into one of the most creatively powerful times of her life, and proving that you can be a fully-realized creative woman with a tribe, and still manage a loving and well-connected home life. Not easy for anyone by any means, but she was doing it. I wanted to honor this amazing unfolding in a visual way. I had always intended to make the Empress in The Portland Tarot into a card that honored the empire-building ambitions of women, too. I always chafed with the idea that the Emperor got to sit on a throne, while the Empress was in charge of the field, sometimes narrowly associated with life-giving/agrarian imagery. Sure, from an archetypal angle, the Empress does represent our connection with nature and Mama Earth; I deliberately acknowledged that connection with an abundance of growing things within her office, as well as the vine patterns on her dress. However, I feel that today it is important for women to be seen as vital and creative in their own efforts of empire-building. How I see the Emperor and Empress to be different is that the Empress does have ambitions, but she is more inclined to lean into community and to discover that by nurturing herself and her own creative journey, she can have more to share with the rest of the world. She looks to help and be helped by others, and finding common ground and language are key elements to her building efforts. The Empress is more organic in her approach to success, vulnerable and barefoot in her business setting. The lotus crown is a symbol of her sacred connection to the earth (and of course, also Liliana’s work with Lotus Lantern Healing Arts). Her little one is dressed as a rabbit, a symbol of creative joy and abundance. Her office overlooks the Portland skyline, to visually illustrate the empire she looks over every day, and the great reach of her work. Within the office is a cash register, to acknowledge that she, too, can accrue wealth (a notion I believe women are working to heal and embrace), but that the gathering of resources has purpose and is rarely done for its own sake. Quan Yin statues stand to either side of the room to represent the presence of compassion in her dealings. Liliana embodies all of this to me and more, and has taught me so much about the Empress archetype over the years. She even put together this wonderful review of the deck below… just because she loved it so much and wanted to support me. She’s a natural nurturer! 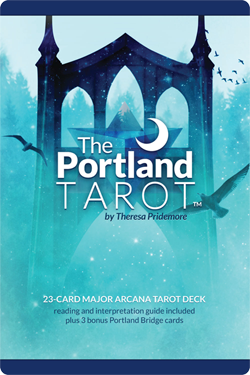 Liliana LOVES The Portland Tarot from Liliana Barzola Read on Vimeo. A creative and intuitive tour-de-force, I am delighted that she is representing this powerful feminine energy in The Portland Tarot!